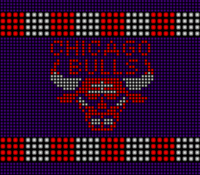 Hey guys, I'm learning programming with GL Basic and have been playing around making some NBA 2D graphics. I'm a total noob to this stuff but it looks like it wouldn't be that hard to make a game with practice. So far I've made a simple free throw shooting game with Kobe and Shaq (I was watching an old Lakers game on Youtube and was inspired lol. Would be cool of some of the guys in the community here could come together and make a game. GL Basic has 3D programming too but I'm just now learning the 2D stuff. Pretty cool, best of luck with it! Andrew wrote: Pretty cool, best of luck with it! Thanks! I'm having fun learning this stuff. I made a practice Bulls gym and a Jordan character to shoot around. Trying to work out all the mechanics for dribbling and jumpshots. I am working on jump shot animations. Drawing all of these out a frame at a time takes a while but its fun.